And believe you me, I am no expert. Ha--far from it. I still struggle to condense and creatively address back story in my novels. In the book, SAVE THE CAT, by Blake Snyder, there's a method called The Pope in the Pool. Snyder refers to a script where back story was introduced while the Pope was swimming laps. So what did the reader focus on? The Pope in a freakin' bathing suit in the pool! Very clever and now I can easily spot this method in movies/shows/books. 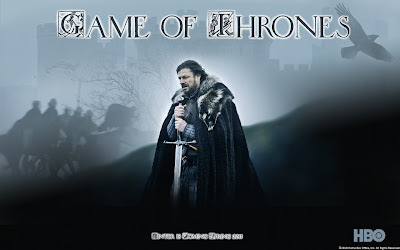 The most recent example is in the HBO show GAME OF THRONES (have you watched it or read the series, and if so, did you love it as much I did?). Sometimes back story was introduced amidst some *cough* racy or scary scenes. And it was brilliant! In a nutshell, we need to sprinkle back story here and there amidst some action and dialogue, to keep the reader engaged. But that in itself isn't easy. Not at all. But I have gotten better at it. That's when Mr. Head hung his head and let out a low, guttural moan--the sound Phil used to make after coming home from work. He said it's "the sound of a man staring down a dead-end career all the way to the grave." Mr. Head, the second dying man I'd met, rose from his chair. So the story moves along with Mr. Head and at the same time we learn something about Phil (his father). It's just a sentence or two sprinkled into the action and that's all we need, for now. Backstory is only one aspect that needs to be handled this way. I talk about this when I give advice about world building in Fantasy novels too. You, as the author, have to know as much as you possibly can about your world, character backstory, world geography, culture, the laws of physics, magic, whatever. But you have to keep in mind that the reader doesn't need to know everything you know. You have to let those details be revealed organically, when the plot or some characterization or dialogue calls for it. Otherwise it will get in the way of pacing, and rising or falling action, and end up boring the reader. Of course this is all so much easier said than done. I'm not very good at it myself. I like Matthew's points too! There's been plenty of time when too much backstory of a story gets in the way of pacing for me. One example I can think of is the Girl with the Dragon Tattoo series. Sometimes those stretches of backstory just go on and on and on. I would totally skim through those sections because they were so boring (in my opinion). Maddy, I don't know how but I got sucked right in. Hubz didn't until second episode and then he was a goner too. That is brilliant! It's easier to put a sentence hear or there in dialogue, but to get it in when all the action is going on and no one is thinking about it? Awesome! Good advice. I'll have to pay attention to this in my manuscript and see if I'm doing this. Also this image is going to stick with me. Next time I think about backstory or world building I'm going to think about the Pope swimming laps. I'm working on the backstory thing. It's hard sometimes, when you love a character so much to remember that the reader doesn't need to know absolutely everything about them! So I heard someone mentions somewhere that backstory isn't as important as it used to be because readers don't have the attention span they used to. Is that even true? Love, love, love the book Save the Cat! So much good information! I think chapter 1 should only have a sprinkling of backstory, in the action if I can help it. I've heart you can have larger chunks in chapter 2. My thoughts? That I totally need to use that more often!